Deep Spoiler - A newly designed, more aerodynamic front Spoiler (Air Dam)- extremely strong and lightweight, made to custom fit Plus 8 front wings. Different from '99 OK's' existing custom built Deep Spoiler, this is a more streamlined and aerodynamic shape, made from three adjustable pieces combined to produce a custom fitted, removable one piece add on. This Spoiler can be combined with a protruding or flush fitting 'Splitter' (below) for extra strength and downforce if required. Splitter - A custom made, machine routed and hand finished, lightweight but strong, weather resistant phenolic plastic covered marine plywood. 'Historic' Spoiler - An extremely strong but lightweight, removable, curved under Spoiler with built in cooling ducts to suit historic look Race or Roadgoing Morgans. Two cost level kits are being developed - A lower cost Aluminium shroud - Available with or without correct sized black ducting pipe and stainless steel dome head fixing screws complete with fitting instructions. This kit is suitable for entry level Plus 8 racers or 'Track day' cars with large front discs (302mm outside diameter and above) Also in production is a top of the range, carbon fibre shroud - Heat resistant, lightweight and very strong, best suited for serious Plus 8 race cars. OK RACING have been using the American version of a waterless coolant ‘Evans NPG-R’ for some years now, with good results. 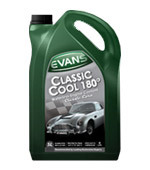 But in 2011 at ‘The Bentley Drivers Club’ Silverstone Meeting, Evans UK offered to replace our water contaminated ‘NPG-R’ coolant with their own ‘Classic Cool 180°’, we jumped at the chance! They purged '99 OK’s' entire cooling system with a hygroscopic ‘Prep fluid’ to remove any water and then filled up with 9 litres of the dark green ‘Classic Cool 180°’. In the final race of the day, ‘The Allcomers Scratch', we finished 2nd to a well driven Clubman. On a very warm day, the engine temperature remained below 80°C throughout the entire race. Last year they recommended replacing the ‘Classic Cool 180°’ (which is now in Matthew's road going TVR Cerbera) with the latest formula, particularly developed for race engines (a rich red liquid now in Team colours !). So good has this formula been, that we put it into the McLaren M10B F5000 for the first time at the ‘Silverstone Classic’. 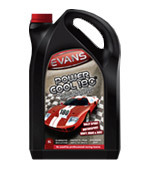 We can strongly recommend this product and the support Evans UK bring with it! 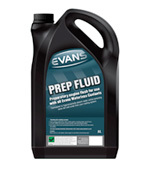 A preparatory engine flush for use with all the Evans automotive products. Formulated to hygroscopically absorb water, whilst removing loose dirt and scale from your cooling system. A waterless engine coolant specially formulated for classic vehicles. Classic Cool 180º protects engine cooling systems from -40°C to 180°C. The unique properties prevent many of the problems associated with waterbased coolants such as Corrosion and Overheating. A waterless engine coolant specially formulated for performance vehicles. Power Cool 180º protects engine cooling systems from -40ºC to 180ºC. The unique properties prevent many of the problems associated with waterbased coolants such as Premature Detonation and Overheating. 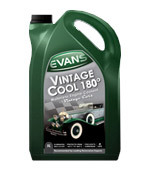 A waterless engine coolant specially formulated for Vintage vehicles. Vintage Cool 180° protects engine cooling systems from -40°C to 180°C. The unique properties prevent many of the problems associated with waterbased coolants such as Corrosion and Overheating. Machine routed edge, hand sanded with bead blasted satin finish. Multiple fixing positions to fit all sizes ! Pre drilled for six point crutch strap Harnesses. Please ring for the price and to discuss the various custom made seat fixing options available. A lightweight, adjustable hollow T45 tube, with machined high specification alloy clamps and phosphor bronze rose-jointed drop links. This is a front anti roll bar that we are developing for '99 OK' - Most race Morgans (and road going Morgans for that matter !) suffer primarily from oversteer (the back end lets go before the front) so this ARB (sometimes called a 'sway bar') aims to stiffen the front end of the car and control excess body roll, whilst allowing softer springing, which helps with bumpy track or road surface conditions ... it's much more forgiving over rumble kerbs !The kit comes with a pair of ally strengthening plates, all necessary high tensile fixings and fitting instructions. Please ring for further details and price. These are two upgrade brake kits we have developed for '99 OK' using ‘HiSpec’ components (already a well proven manufacturer in Morgan racing). They are CNC machined from a solid billet of aluminium, hand finished and hard anodised, providing a rigid non-flex slimline design. The Class A 6 piston Front Brake Kit, is a direct replacement for the commonly used 4 Pot 'AP Racing' set up, by either reusing your existing bells & brackets (if in good condition) or replacing with our compatible new aluminium brackets & anodised bells. Using 315mm vented discs – 28mm thick for rigidity, but light weight. This thickness allows for an ‘off the shelf’ fit for the best ‘Performance Friction’ Carbon Metallic brake pads. The kit includes ‘Speed Flow’ ENS Banjo hose ends with stainless steel braided pipe and all necessary high quality nuts, bolts and washers. The Class A 4 piston Rear Brake Kit is a direct replacement for the commonly used 4 Pot ‘Wilwood Dynalite’ set up. Rigid and hard anodised, they are a high performance upgrade complete with 300mm vented discs - 22mm thick. Reuse your existing bell (if in good condition) or replace with our hard anodised bell. The kit includes a new adapted aluminium bracket and ‘Speed Flow’ ENS Banjo hose ends with stainless steel braided pipe and all necessary high quality nuts, bolts and washers. Please call us for prices and to discuss your specific requirements. We have tried a number of different exhaust fillings for our repackable silencers over the years. This highest spec 'S2 G' silica is the best we have ever used. It has the highest temperature melting point and the roll makeup is so clever and 'friendly' to use. Just loosely roll it onto the centre perforated pipe and insert into the silencer tube. The really clever thing is that it's nylon stitching melts and the glass yarn expands to fill any void space. Unlike Basalt or 'E' glass which are made up of individual strands, the continuous yarn (it looks like dreadlocks once in use!) does not get blown out of the perforated pipe. The photo shows the packing unchanged after a seasons racing! Charged by the metre and 700mm in width (other widths to order). Plus post, packing & VAT. *A custom made wide tube with lightened flanges and low friction 'Teflon' Coated slide yoke - The kit comes with Getrag & BTR Axle compatible, high tensile lock nuts and bolts. A similar specification propshaft, for Matthew's new 2014 Class A Race Car, which uses a close ratio race spec T5 gearbox, is currently in development.